Adrenalin pumping, heart stopping, fear inducing! 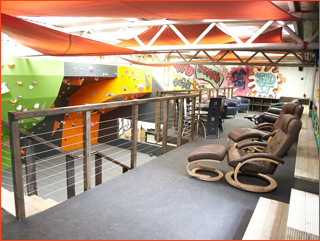 The unique Rokt Climbing Gym offers indoor climbing at its best. 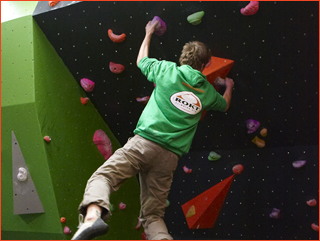 Whether you’re an experienced climber, you’re a little rusty, or you’ve never climbed before - you are welcome to use our facilities. Our aim at Rokt is to create a safe, energised, friendly and social atmosphere. 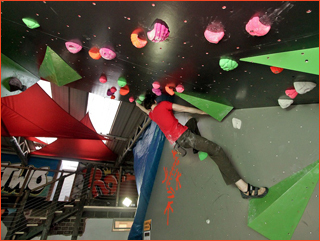 Our climbing offering is extensive and will provide everything a climber needs to train safely and to enable a sustained progression through the grades. Our staff are selected for their friendly approach, extensive experience and willingness to help. You will always be made to feel welcome. Climbing doesn’t have to be an expensive sport, you can get started with as little as a pair of boots and a chalk bag. Gear hire and starter kits are available from Rokt. We can help you to push through your personal plateau, climb in a group with friends, colleagues and family and we offer events throughout the year encompassing competitions, socials, film nights, guest speakers and DJ nights. We will also be launching holidays in the UK and Europe. Call in or ring us to book an induction and we will walk you through all you need to know to climb safely and unsupervised. 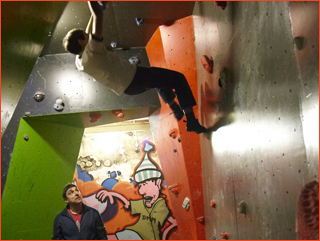 If you are an experienced climber, come along, pass a competency check and you’re good to go!